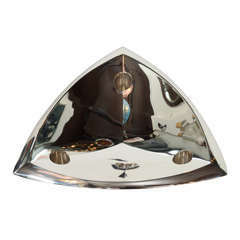 Large Art Nouveau Sterling Silver Oval Picture Frame by Tiffany & Co.
Sterling Silver and Mahogany Engine Turned Picture Frame by Tiffany & Co.
Large Mid-Century Modern Sterling Silver Picture Frame by Tiffany & Co. This refined picture frame was made by Tiffany & Co.- one of America's most storied luxury design firms, specializing in sterling silver, since 1837. 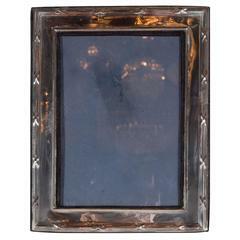 It features an austere rectangular frame in lustrous polished sterling silver. With its straightforward modernist form- free of embellishment- it would be a winning addition to any style of interior from classic Mid-Century Modern to contemporary. The frame is designed to house a photograph roughly 13.5" high by 10.5" wide. It is signed "Sterling Tiffany & Co." on the bottom. Excellent condition. American, circa 1970. Dimensions: 12" W x 15" H x 5.5" D.